Dylann Roof Pleads Guilty To State Murder Charges For Charleston Church Attack : The Two-Way Roof shot dead nine people in the basement of a historically black church in 2015. He has already been sentenced to death on federal hate crimes charges. Dylann Roof appears at a bond hearing court in June 2015 in North Charleston, S.C.
Dylann Roof, who gunned down nine people in the basement of a historically black church in Charleston in 2015, pleaded guilty to murder charges at a South Carolina state court. In exchange, a circuit judge is expected to hand down a life sentence Monday afternoon, as The Post and Courier reported. 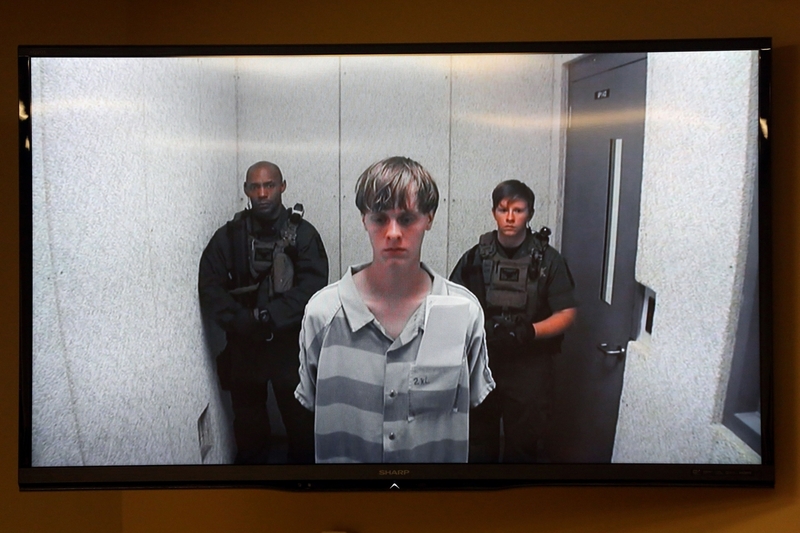 Roof pleaded guilty to nine counts of murder, three counts of attempted murder and a weapons charge for the massacre at the Emanuel African Methodist Episcopal Church, which he planned for months. This is not Roof's first trial. A federal jury unanimously sentenced him to death in January on federal hate crimes charges, as we have reported. "The state plea agreement will avoid a second grueling trial for survivors and family members of the victims," NPR's Debbie Elliott told our Newscast unit. "South Carolina prosecutor Scarlett Wilson has characterized the agreement as an insurance policy that Roof will spend the rest of his life in prison should his federal death sentence not stand." Monday's hearing "could be one of the last times for victims and their family members to have Roof hear their words," the Post and Courier reported. Roof is expected to be transferred from a local jail to a federal prison out of state, a law enforcement official tells The Associated Press. There, he will await execution.